Contrary to the popular historical narrative, the Union’s effort to rein in the Confederacy and end the secessionist military rebellion now known as the Civil War was incomplete upon the iconic April 9, 1865, surrender of Robert E. Lee at a Virginia courthouse in Appomattox. While ending the conflict in Virginia, the legendary courthouse meeting between Lee and Union General Ulysses S. Grant prompted a series of subsequent surrenders in numerous Southern states and Western territories over the following months. On June 23, a full two-and-a-half months after Appomattox, the war finally came to its conclusion at the Doaksville settlement in present-day Oklahoma with the surrender of Stand Watie, the last Confederate general to lay down his arms. Watie, a staunch Confederate whose loyalty and battlefield exploits had earned him the rank of brigadier general, was, perhaps, far too complex for our sanitized and more linear national historical narrative. He was a Native American, a Georgia-born Cherokee who commanded Southern troops in the Indian Territory consisting of battalions of Creek, Seminole, Cherokee and Osage natives. He was one of many natives who’d left their Southern lands behind three decades prior and entered the Oklahoma Territory by way of the infamous “Trail of Tears,” a series of forced relocations enacted by government authorities following the Indian Removal Act of 1830. And, like a number of his native brethren, Watie was a wealthy planter and landowner who was accompanied on the western trail to the Oklahoma Territory by the sizable number of enslaved Africans he owned. “We couldn’t ignore the fact that the Five ‘Civilized’ Tribes were actually slave states legally, where they did practice slavery,” said Paul Chaat Smith, associate curator at the Smithsonian’s National Museum of the American Indian. Smith, a Comanche, noted the need to put the term “civilized” in quotations given its skewed 19th century Eurocentric application to the Southern-based Cherokee, Chickasaw, Choctaw, Creek, and Seminole nations. The author of several books on Native American culture recently facilitated the museum’s “Ámericans” exhibit, which included information on the Trail of Tears, and a “Finding Common Ground” symposium exploring African-American and Native American relations. Although Native Americans, long before Waite and like many cultures, had practiced the enslavement of prisoners of war within and between their own cultures, they didn’t engage in racialized chattel slavery until the late 18th century amidst the increasing encroachment of white settlers. While this violent encroachment and its associated “civilization” efforts by whites impacted and influenced all of the five major groups, it was the Cherokee Nation that most actively engaged in and profited from Southern enslavement. Coleman has pointed out that by 1809, 600 enslaved Africans were held in the Cherokee nation alone, a number that increased to 1600 by 1835. 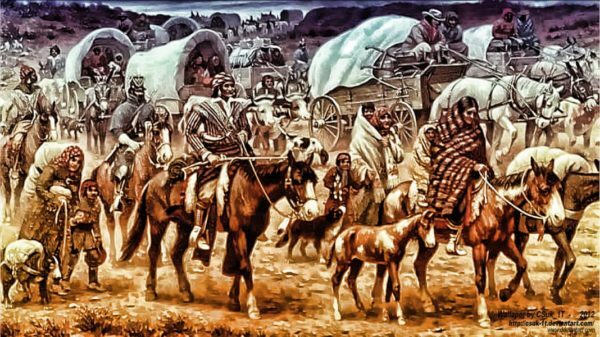 It was during the 1830s, in the aftermath of the Indian Removal Act, that the decade-long process known as the Trail of Tears occurred. Fueling the desire to claim the lands of those believed to be “godless savages” was the white settlers’ government-backed wish to expand the cotton industry, and the recent discovery of gold in parts of the South, particularly North Carolina. As a consequence, thousands of Native Americans were evicted from their common lands and forced to walk thousands of miles to designated Indian Territory in current-day Oklahoma, many dying from starvation and disease along the way. Watie, one of a smaller faction of Cherokees who supported removal to the Western territory as the only way to preserve the Cherokee autonomy, was among those who signed the 1835 Treaty of New Echota that ceded native lands in Georgia in exchange for the Western territory. While he and the Africans he enslaved would make the move west in 1837, of the estimated 15,000 Cherokee in Georgia forced on to the trail in 1838, as many as 4,000 died. “There were even Black Codes to keep in line the free Black populace, given there was a free Black population living among the Cherokees, Choctaws, Creeks and other groups,” added Coleman. By 1860, there were 4,000 enslaved Africans living in the Cherokee Nation alone. Upon the Civil War, in 1861, Watie didn’t hesitate to join the Confederacy, given his common interest with the wealthy slaveholders of the South and his view of the federal government as the Cherokees’ primary displacer and enemy. He was pivotal in establishing the first Cherokee regiment of the Confederate Army known as the “Cherokee Mounted Rifles” and in securing early Confederate control of Indian Territory. Unwilling to acknowledge Confederate defeat upon Lee’s Appomattox surrender, Watie would ultimately close the epic military chapter of America’s most historic internal conflict by finally laying down his arms to Union Lieutenant Colonel Asa C. Matthews at Doaksville on June 23. It is a little-known conclusion to a pivotal American event.